Get your VIN number for your car. In order to find someone to help you replace your car key, you’ll need to have your VIN number ready. If you can’t find it inside your car, you can find it on your insurance information. The VIN can be located on a rear wheel, front of the engine bloc, trunk, door jam, or the frame of the car between the carburetor and windshield washer. It is also important that you know your year, make, and model to help get your specific kind of key you’ll need to open your vehicle. Call a nearby auto locksmith. Your first option is to go to the nearest auto locksmith. They tend to give the best deal, usually about half as much as the manufacturer or dealer will charge. On top of that, they typically don’t charge to visit your car. Hardware stores aren’t usually equipped to duplicate car keys, but an auto locksmith is. The older your car is, the better chance you’ll have of being able to duplicate the key. 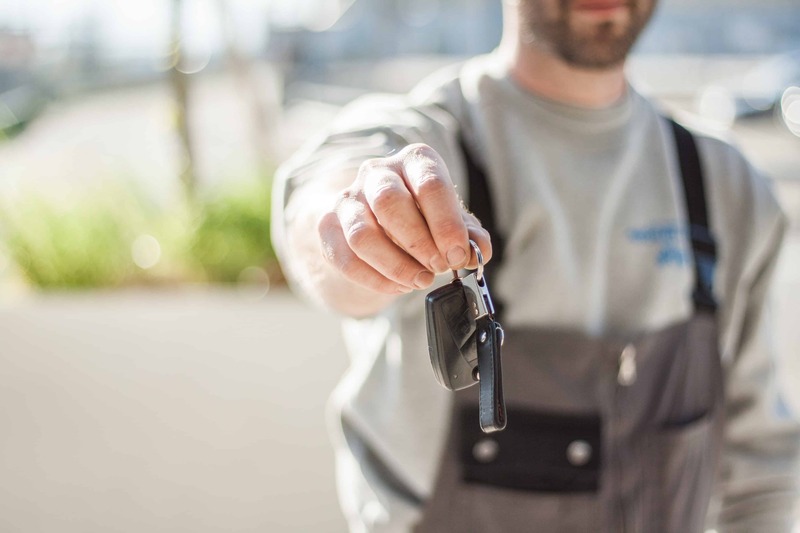 If you’ve lost a key fob, a good locksmith might be able to help make a new one and reprogram the replacement. It will depend on the sophistication of the key. Look for discount replacement keys or key fobs online. Aftermarket keys and factory replacements can be found online for less. You can either find a reputable dealer on eBay or look for companies that sell replacement car keys. As mentioned before, the older your car is the simpler it’ll be to replace it. Before you buy, call around to see who would be willing to program the key bought online. Check your warranty or car insurance to see if they cover key replacement. Depending on how new your car is and how high-end it is, your key may not be replaced by anyone except the manufacturer and distributor. With a warranty or car insurance, you might be able to get a discount. When purchasing, make sure you have all your car information, a valid photo ID, and other sets of keys you may have for the dealer. Again, depending on the sophistication of your car keys, you could try to see if your local locksmith will duplicate them. If your key has a microchip, they won’t be able to duplicate it. If it has a transponder, the locksmith could potentially do it for $50-$120. Buy an aftermarket replacement car key. You can simply search “aftermarket electronic car keys” on the internet and find plenty of replacement options for electronic car keys. You could get a new car key for 75% less than what a dealer would charge, but you’ll still need to get it programmed so check prices before purchasing anything. Get a new set from your dealer. Depending on how new your car is, this could cost you up to $200 and more. But, if you want a key that you know will work and you need it quickly, this is not a bad option. You can visit your local dealer – Honda, Chevrolet, Ford, etc. Program your new key to your car. When you get your new car keys, you might be able to avoid a special technician and the costs of having them program your key. Depending on your car, the owner’s manual might have instructions involving opening/closing the doors, turning the lights and other electronics on and off, pressing buttons like a code, etc. Sometimes if it’s really cold or hot the electric key might stop working properly. If you get it a little too wet, sometimes water can work its way in there and cause some issues. Let the key rest for a little while before you pay a lot of money to replace it if this happens to you. A key fob can stop working properly after you have a change or repair in the car’s electrical systems (like a battery). Find your owner’s manual and find out how to reset all your keys according to the instructions provided. If you notice your key working badly over the span of a couple days, your battery could be dying. A replacement car battery is inexpensive compared to a full replacement and can be found online, at an auto-locksmith, or at an electronics store. Most batteries are pretty simple to replace and only require a Philips screwdriver.